Questions and answers about liquid level measurement. 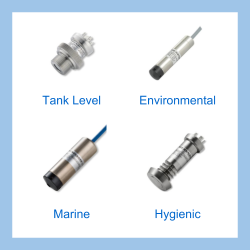 What is the difference between a level switch and a level transmitter? A switch will turn on or off at a predetermined liquid level, perhaps to protect a tank from overflowing or to maintain a minimum / maximum level in the tank. The switch output is typically either a voltage free contact or if it is an electronic switch, a fixed voltage e.g. 12 volts when ON and 0 volts when OFF. A transmitter has a variable output signal, 4 to 20 milliamps current loop is the most common. e.g. level transmitter for a 10 metre high tank, will read 4mA if the tanks is empty, 12mA if half full and 20mA if full. Send us your enquiry for a product associated with this Liquid Level Measurement page, and get assistance with selecting a product for your application.